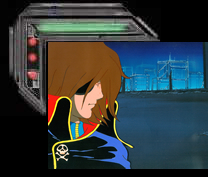 Captain Harlock is a futuristic German Iron Cross pilot, who meets Tochiro, an engineering genius, in American occupied Japan. Except in this cartoon "Japan" is the planet Earth, and the Americans are an alien race called the Illmidias (aliens who suffer from strange facial hair). In case anyone misses this in the introduction, the anime takes you back in time to meet their ancestors during WWII to make sure you get it. With no ship and no purpose, Harlock walks the war torn streets of Planet Earth, "We’re defeated, yet we still exist," until he hears the voice of "Free Arcadia", a pirate radio station headed by his only love, Maya, who brings hope to disgruntled citizens. After hearing his love on the radio, he searches the streets until he finds her, but the Illmidas find her first. And in a gun battle, Maya is fatally injured (she spends the rest of the cartoon dying) and Harlock loses an eye. Since his girlfriend is now dying, Harlock decides he’ll carry on her fight, and become a new hero for mankind. Tochiro informs Harlock that he built a ship, the Arcadia, which they can use to fight against the Illmidas. I’m not kidding, maybe something was lost in the translation but the English dubbed line was, "I built a ship. It took a long time." Harlock leaves Earth, tries to help another group of aliens, and then comes back to Earth to find the Earth Resistance crushed. He looks over the remaining shreds of humanity and gives a speech; "Whoever wants to live free, must pledge allegiance to my flag (the skull and cross bones) and make their home in the "Sea of Stars"." A handful of men join Harlock. 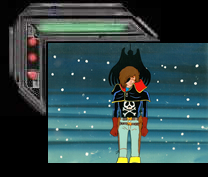 Harlock judges the rest as unworthy and flies into space. 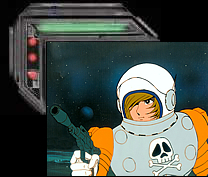 The Earth Occupation Force Captain is in such awe of Harlock, he wants to have a space ship duel with him. He leads the Arcadia away from the Occupation Force’s main space ship fleet and they fight battleship to battleship. 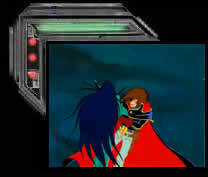 Harlock wins, then takes on the main force and gives the Illmidas a warning to stay away from the Arcadia. If you can look past the Nazi crap, the story is decent, character designs are nice, and it’s one of the few anime to have a strong female character, Emeraldas.